Yuko Nogami Taylor grew up in Tokyo, attending a prestigious primary school historically attended by the family of the nobility. 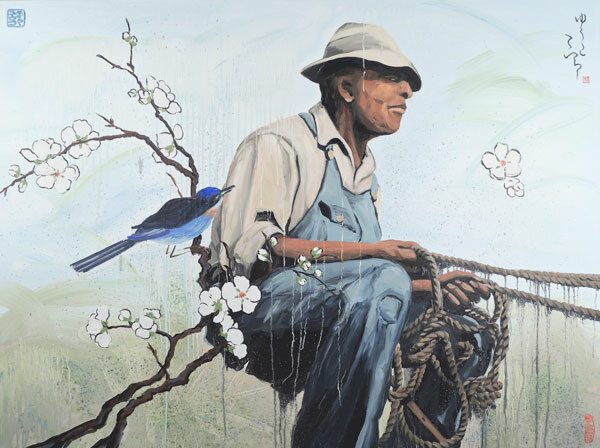 Leaving her predetermined life in Japan Yuko traveled to the Southern United Stated and found art as a way of expressing herself by merging the heritage of Southern African-American culture and Japanese culture into oil paintings. Did you learn how to paint while growing up in Japan? I learned how to paint through my fundamental schooling in Japan. Looking back, I realize I received complete traditional training when I was in elementary school. I learned positioning & perspective. I learned pencil drawing with light and shadow application, color wheels, and vision for art applications. It taught me the understanding of using each instrument and how to use them with respect. My education went beyond 2D art applications and 3D hands-on experiences helped refine my 2D perspective. My works were recognized and awarded yearly within the school. I had a great sensei (teacher) who taught me the structural guidance in the heart of the Japanese art application. The western art elective sensei allowed me to do anything that I wanted to do and that supervised freedom turned out to be the greatest guide for me. The freedom given allowed me to develop an intuitive and creative approach to my artistic process. Your depictions of African Americans seem to tell a story. What message are you conveying to the viewer with these pieces? The reason that I longed to choose and express these nameless people is the desire to earn their inner strength in me. It may be easier for the viewer to justify my paintings with the connection to African American heritage through my family/children, but that is actually not the fundamental piece for me. My painting series started with a story that I would have with my inner self. The motivation was not to paint striking images, and it is actually the complete opposite of that. I quietly express my love, compassion, and respect to the life of all, and such thought just seeped through me. Painting is a solo action and the time you apply to the process is detached, yet personal. Those images are my roadmap in depicting the energies that come forth from my children, my desires, my despair, and my love of life. These fundamentals of seeking guidance from someone who was strong are found in all humans. The body is what you are captured in, but we are all searching and cultivating the light of the mind/soul so it may best shine through. If there’s any message I can convey through my work it is the recognition of a personal connection to the strength of human, which will be found in everyone and it is the fundamental beauty of it. You moved to the US in 1990, however, you did not publicly display your work until 2005 – why is this? I did not know if I would become an artist until much later. As soon as I landed in the South, I was struggling to live and support myself in the new land and support my children. I had to choose a divorce and it became unique as I have a disabled child. During this process, I had to realize [that] I had lost my back-bone when I moved out from my land. I felt I had lost my identity, fame, privileges, language, confidence, common sense, and abilities. Although I was disadvantaged I did not lose [my] ability with numbers, art, and finally myself. Looking back, I was storing the power of the voices within me during these times, not knowing I could become a painter. When I started [I] had the means to revisit art and related activities. I took a few art classes that the city offered after my work hours. I wanted to develop my oil painting skills more. I had to get used to the materials. That was the start, and further development occurred around 2004 or 05, thanks to the support of my family and friends. I found the opportunities to show my artwork from the little call-of-art venues in the city. My spirit was rolling out from my shell and found its path to become an artist. When I was finally satisfied in the way the canvas and image came together. When I could see that my spirit was transferred to the painting that I made, that’s when I felt I may have finally become an artist. If or when that happens, I usually do not remember how I painted my painting. It’s as if something else beyond me has painted it for me. That is the experience of being an artist. Discuss your nihonga mineral series? I started out to seek the philosophy of the Japanese art style because I found its roots connect well with me. I often find my ideals in it, because its meticulous process settles me as a person. The art materials of Japanese mineral painting have its own traditions and has less versatility compared to today’s western art materials. It requires patience and time-consuming complex steps - simplicity is not the focus. Numerous pigment colors have their own characteristics and histories. Each pigment has different particle sizes and personality. The binding glue of Nikawa’s strength needs to be adjusted and is the key to finishing paintings. Japanese craftsmanship is amazing and historic, its tools and materials are a complete vessel for appreciating the world of Japanese spirit and culture. This is all still available today because it is fundamental to the expression of said art. The culture of Japanese art is often not to paint what you actually see. The foundation of viewing Japanese art is to “feel” therefore, (as crazy as it sounds) the most important messages in these paintings are often not explicitly visually evident. This style is true across the paintings I create. I realized that going back to visit the Japanese mineral painting would better ground me for completing my oil paintings. I do not prefer or dislike a particular color pallet because all the elements are necessary to enhance each other. If I had to answer, I would say I like cool colors but prefer to focus on warm colors. My inspiration is the tool that gives me the strength to put my thoughts together. What part of art do you love/hate? I love when my images harmonize within the canvas naturally. I hate when I receive racial comments when it is completely not about that. If you could see your artwork displayed in any venue in the world where would that be and why? Here in the Southern US. That is where I dream it belongs.